Being boss of a company that works in timber must be about the best omen you could get for the upcoming lunar new year. 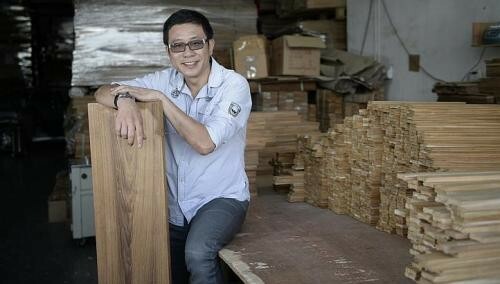 "This year will be very good for the company then," says Mr Jason Sim, Jason Parquet chief executive. Indeed, he is brimming with optimism for the year ahead, with hopes that his company will expand and shares go up, though he proceeds with a certain level of caution. I may be a high risk taker, but I don't rush into investments. It all depends on the opportunities. Q: How well did your investments do in 2013? Last year was a good one for me and I expect it to be better this year. I think I took the right gun and shot the right bird. I earned some money, which is good enough for me, so if I'd lost money, last year would not have been good. In terms of how well you do in investments, it's not because of the economy. It depends on your foresight. I also met a lot of new people, it's also an investment. When you get to know more people, there are more opportunities, more lobang. They can tell you what investments to go into. Certain things you have to depend on your friends, you can't always depend on yourself. I've some penny stocks, I buy all kinds. Sectors I look at include manufacturing and construction. If you buy penny stocks at one cent and they go up to two cents, you make 100 per cent. If you buy blue chips at $10, it's very difficult for them to go up to $20. Maybe you'll have to wait for 10, 20 years. I play for fun, so that I can make some pocket money sometimes. I made a bit from a condo I bought in 2010. I sold it early last year, and earned between 20 and 30 per cent. Q: What's your investment strategy? It depends on rumour. A lot of people talk, and you have to see if what they say is real or not. An example could be people saying a certain company is going to collapse and the stock is very cheap. Either you make double or earn zero returns, so that's high risk. So far so good. Q: What are you looking at this year? I hope there will be a chance to grab a few properties, be it residential or warehouses. Whatever it may be, as long as it's cheap I will go in and buy. I'll wait for the sky to turn green. If there's an opportunity for blue chip stocks, I'll buy some and hold. Either blue chip or property. If it's cheap, I'll go in and buy, if expensive, don't buy.